Now, from time to time you’re going to see some repeat offenders. I mean, the bike scene’s not that big and I have to go to work and stuff, so I can’t always been out in the boondocks with my hot-o-meter at the ready looking for new and unusual safety pin-ups. As the weather improves and I find more time, I’ll endeavour to see what Heidelberg has to offer. In the mean time, let’s reflect on last Friday’s shenanigans – Melbourne’s first all-girl alley cat, Death Becomes Her. Kindly organised by the lovely Zoe, almost fully recovered from her recent dooring, and well supported by a range of sponsors, the event brought out a great turn out of Melbourne’s cycling vixens, many of whom were dressed to impress and all of whom were ready for a ride. Because I’m shamelessly parochial, I’m going start this off with Sally, who has previously demonstrated that we could/should wear helmets in France, and was also coincidentally my partner. 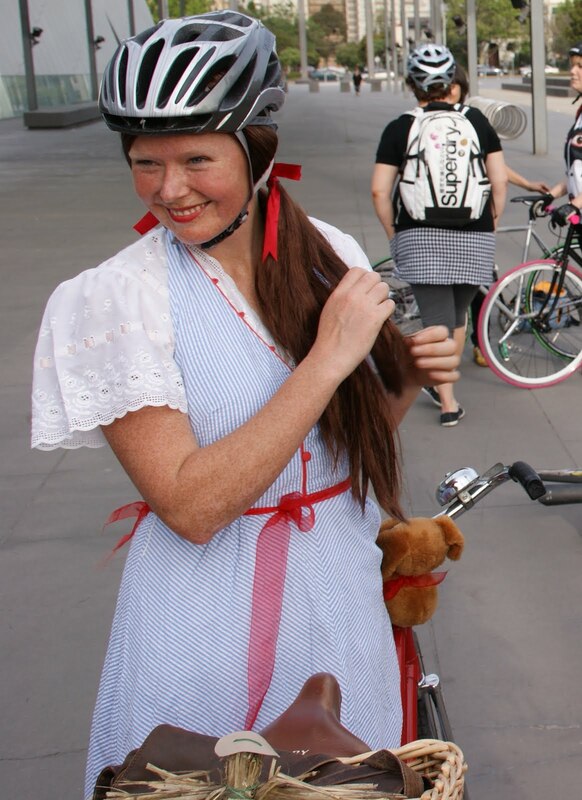 Not only was she extremely good-tempered about my demands that she come as Dorothy so that I could finally use my broom, but she can stuff a good cupcake, and she too knows how hot the wig/helmet combination can get. We thank the academy for their kind (joint) award of best costume. And ta heaps to Pony Bikes for hosting the party afterwards.